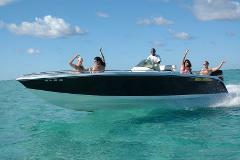 What about discovering the South West coast of Mauritius on board our wonderful Islandian speed-boat? Your trip includes cruising along the lagoon, stop by Tamarin Bay for dolphin-watching, Benitiers Island or even the spectacular Le Morne! Discover the South East lagoon of Mauritius and enjoy the journey to Ile aux Cerfs on board of BlueAlizé speedboat.